I am seriously delinquent in reporting this, since I meant to post it after Karyn’s baby shower. Whatchagonnado? Pattern: By Kristin Goedert, available on Knitty. Made For: My future niece or nephew, due to arrive April 6th! This is perhaps the quickest I’ve completed a knitting project. I began in September, just after learning about my sister’s pregnancy. She and my brother-in-law decided not to find out whether they were having a boy or a girl, so it wasn’t hard to pick this pattern—multicolored to please any little kid! This was a project full of learning, too. The knitting was simple, and changing colors so often kept it interesting. I learning how to weave my ends in as I knit, so I didn’t have a bunch of loose ends to clean up when it was done. This was also my first time with blocking. It was difficult to find a space in my tiny apartment to lay it out where my cats wouldn’t bother it too much. In the end, they bothered it a little bit, but only when I was giving it attention. I think they were mostly just trying to bother me. The real challenge came when I had to start sewing. I began sewing the Maxi Piping to the fabric with a chain stitch, but after 2 very long movies, several thread reloadings, and not evening finishing a third of the sewing, I had to find a different way. I didn’t want to make too much of an investment in a sewing machine that I would barely use and I didn’t have time to find a friend’s machine to use (nevermind that I only know two or three people with sewing machines). Luckily, I found a very simple beginner’s sewing machine at Target for $25. It only has a straight back and forth stitch, but I can’t imagine ever needing more than that. Sewing the piping to the fabric with a machine took less than a half hour. Thank goodness. 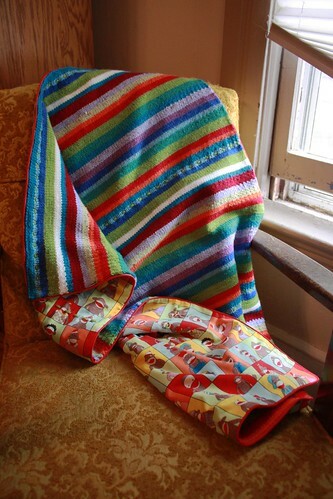 Over the last week I had to work on the blanket, I solved the mystery (to me, anyway) of a hidden slip stitch. After several online video tutorials (including a desperate plea to the pattern author for tips), and adding a couple finishing embellishments, I had finished the blanket. Very satisfying.